Spring clean your way to health and happiness! Spring is almost here, bringing with it green leaves, flowering buds, and for many people a desire to clean and organize. 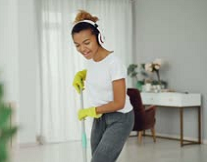 For those who regard spring cleaning as a task worse than, say, visiting the dentist, here’s information that may change your mind: When you can’t get the gym, housework can help keep your heart healthy, significantly reducing cardiovascular disease and increasing lifespan. Beyond physical benefits, there are positive psychological aspects of living in an orderly environment. A study of women showed the importance of creating a home that’s restful and restorative, since living in a cluttered space was associated with feelings of depression and fatigue, as well as higher levels of the stress hormone cortisol. Another perk: Living in an organized home may motivate you to choose healthier snacks. Even if you’re not ready to purge your pantry and clear your closets, you may want to at least start making your bed every day, if you don’t do so already. Doing so gives you a feeling of accomplishment first thing in the morning ; can make the rest of your day more productive; can help you feel calm and less stressed at bedtime and may even help you sleep better. And once you start this neatness habit, chances are your desire for orderliness will spill over into other areas of your life. Hello, spring cleaning!